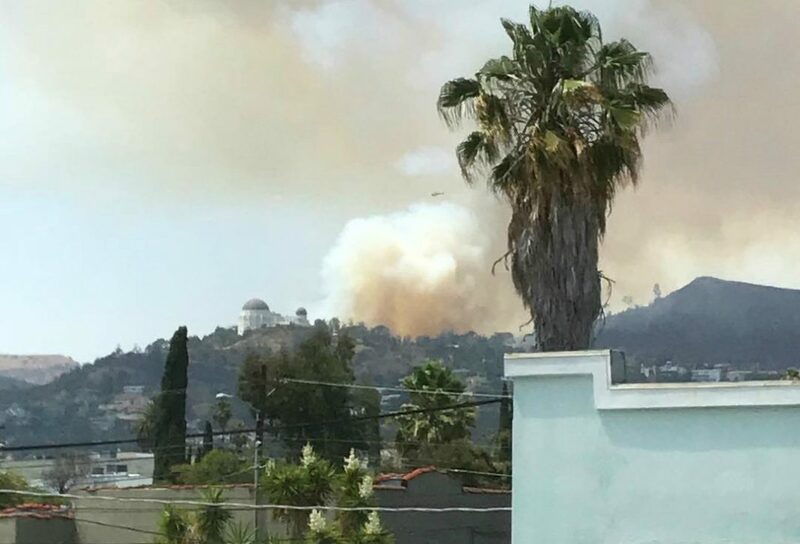 Around 2 p.m., a brush fire sparked in Griffith Park, sending thick plumes of smoke visible from surrounding areas and triggering an evacuation of the area around the Griffith Observatory. While the fire is not yet fully extinguished, LAFD officials have announced that it is significantly contained and firefighting efforts are proving successful. While the blaze was able to grow to nearly 10 acres, it did not pose an immediate threat to the Observatory or other structures in the park. However, ABC 7 reports, some vehicles parked along Observatory Road were damaged, near the point where the fire is thought to have started. The ability to contain the fire so quickly is being credited in part to weather conditions, which were cooler and more humid than in recent days, without the aggressive winds that are often responsible for fires that spread rapidly. “Low winds, high humidity, and downhill burn give LAFD confidence in their ability to combat it,” Mayor Eric Garcetti Tweeted about the fire. While it seems to be under control, that doesn’t mean you should go try to take a look for yourself. Firefighters and police are both requesting that hikers, visitors, and motorists all keep their distance from the area until all fire and clean up efforts are fully complete.